The original title was “the first 50 meters,” but that was way too ambitious. There is a security man outside my building. At least he always sits there and his impeccably ironed shirt has a patch on its sleeve with “security” on it. He sits on a molded plastic chair and I think he sleeps/lives in the ground floor hallway. At least, I saw him lying down once in a small bed next to the stairs. It is all guess work. I cannot interpret even the simplest signs around me. I have had two dealings with the security man. On day 1 he pointed to a spot where I could deposit a bunch of discarded plastic and cardboard packing materials. And over the last two days, he and I have communicated over a key I need for the front gate. Apparently, the padlock goes on the building at 11 pm. I got the key yesterday. My security man showed me how you have to fiddle (a lot) before the key works. With the help of a bystander who knew the words “no original,” it is clear that I have a copy of a copy of a copy. As I walked into my building, he gave me a solid thumbs up. I returned the gesture: we are good. There is a narrow pathway between the electrical transformer right in front of my door and the stalls or vending carts. It depends on the time of day. 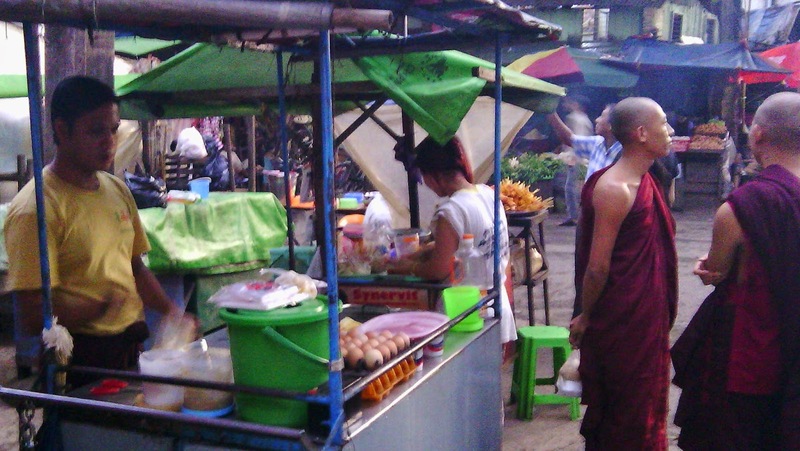 In the morning, there is a fruit and vegetable stall. In the evening, the same space is occupied by a crepe seller and a grilled meat-on-stick seller. Right in front of the transformer is a beans-in-a-leaf seller. 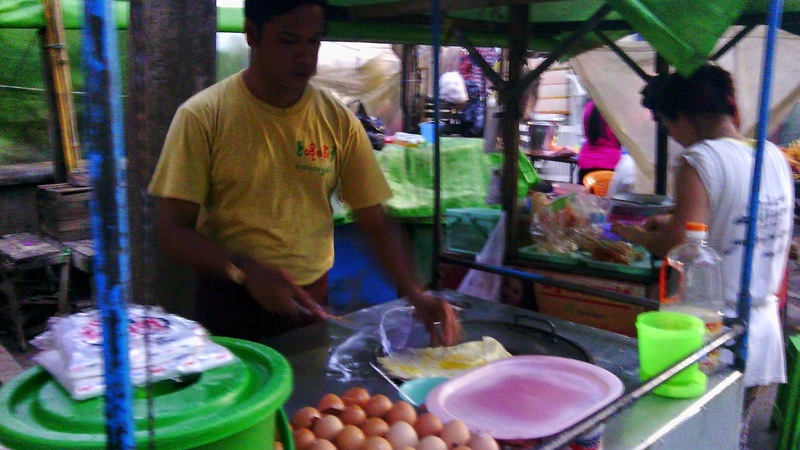 I am a regular customer of the crepe seller: baharata-egg or beharata-no egg. It is a joy to see his dexterity in taking a lump of (rice?) dough, flatting it, pizza-throw style, and frying it on his grill. Dough first, then the egg and the ensemble is folded, sprinkled with sugar and condensed milk and packaged in a plastic baggie in bite-sized pieces, using tongs and a pair of scissors. 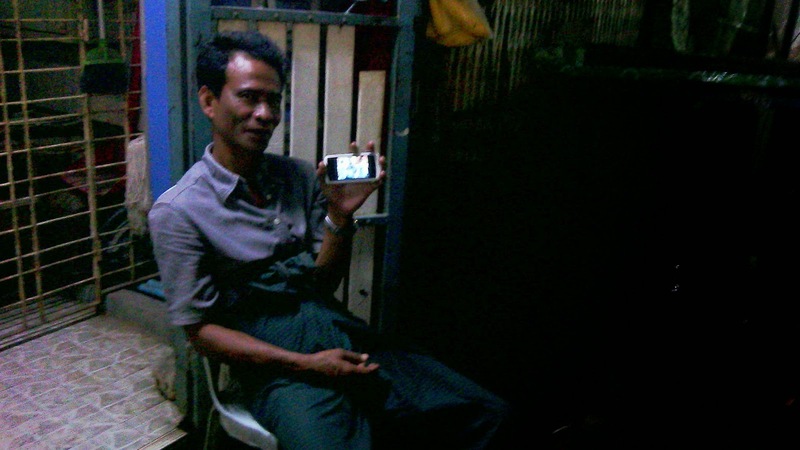 He does good business, although at 300 Kyat (say $0.30) for Baharata-egg, his is a relatively low margin, high volume business. He likes my patronage, but his somewhat stern visage is hard to read. I think he is of Indian descent. I haven’t yet bought any grilled meat-on-a-sticks from his neighbour. They look delicious and he is always grilling them fresh on a little charcoal fire. The question of long ago they were put together keeps me from trying them. Within my building proper and well within my five meter limit is the entrance to a diagnostic clinic. I have not had the need to explore it, but I have visited the freezer in the little grocery store next door. It packs passable ice cream, 300 kyat for a small tub of vanilla and 500 kyat for chocolate. The young woman in the store hands you a little wooden spoon in a graceful manner typical of Myanmar; her right hand extended and her left hand touching her right elbow. There is a hint of a bow and always a smile. It's snowing very lightly here - a dramatic contrast from your 5-metre world! Brilliant - the congestion, confusion, scents and opportunity are all vividly shared. Give it a couple more weeks and it'll be old hat. I surprised myself last night by actually recognizing my neighbourhood as the bus brought me back to town from weekend away. Met fast food voor de deur lijkt honger uitgesloten en dat vlees klinkt aanlokkelijk. Wel voorzichtig met je gezondheid! Verder ben ik ook benieuwd naar wat Cuso je laat doen of juist niet.